The National Park Service has proposed a new rule to allow for concealed carry in National Parks. Nifty. I suggest that my Gentle Readers follow the link to the federal register to post comments. Please be civil, as comments will reflect upon the entire shooting community. My apologies for the intermittent posting this week — it’s rapidly approaching the end of the semester, and final exams are looming. Not the most amount of fun. One of the issues with maintaining a presence online, such as a public email address or blog, is spam. Comment spams are particularly obnoxious, and I’m doing what I can to reduce or eliminate them entirely on this site. PistolGear.com is now selling Springfield XD spare parts. While not everything (like the extractor) is available, a considerable amount of stuff is. If Springfield allows for all non-regulated OEM parts to be sold online like how GLOCK has parts available from Lone Wolf, this will clear up my last roadblock to fully supporting the platform as a full-fledged competitor to GLOCK. Yes, Springfield has a lifetime warranty which is fantastic, but if a tiny part breaks on the day of a match, you don’t want to have to wait a month for them to fix it when you could have replaced it with a $2 part on the spot. The availability of spare parts is one advantage that GLOCK has over the XD, and one that keeps me from recommending it as a SHTF gun. If OEM parts become widely available, I will not hesitate to recommend the XD to anyone. This is ridiculous! Why would anyone want guns legalized on campus? Say a concealed-carry law did get passed, and people started carrying guns. Realistically, what do you think is going to happen? That your safety will increase and you will be able to feel less defenseless!? What about the safety of everyone else? Are you going to protect everyone around you if something happens? Are you so full of yourself that you believe you can? What training will you undertake? What kind of training is possible for college kids to handle a classroom shootout? How will you know what’s sufficient? A couple seminars where you sit at a desk and listen to some dude tell you about how responsible you are for having a gun? A few months at the range? Police or military training? If you want gun safety, wear kevlar! 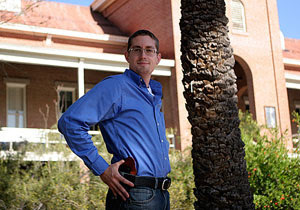 If Norstog wants to know “realistically” what will happen if CCW is allowed on campus, he should look to the State of Arizona’s 14 years of shall-issue CCW, or perhaps Colorado State University’s several years of experience with campus CCW. These problems he brings up are the product of a hyperactive imagination, someone who gets his ideas of firearms more from television and fancy than from real life. The hypothesis that the CCW permit holder is a danger to others is not borne out by the facts. Gun-control advocates are weak. Whether they’re badly outnumbered by gun-rights advocates, lazier than gun-rights advocates or simply don’t have the statistical or philosophical ammunition to keep up with gun-rights advocates I’m not totally sure. Is there a choice for “all of the above”? We have over hundreds of years of precedent (both in terms of the Second Amendment, but also simply the fact that We, The People have owned arms continuiously for that period). We, The People genuinely believe that we have a right to arms. We have repeated court rulings in our favor. We have The United States Constitution on our side. That is, or should be, the “nuclear option” that trumps any argument short of a Constitutional Amendment. I’m not really sure what sort of person can reasonably think that individuals don’t have the right to arms when there are nearly 100 million gun owners in the US, with hundreds of millions of guns in private possession. How can one argue that individuals can’t own guns when there are gun stores in essentially every village, town, and city in the country? Hat tip to Jeff, both for letting me know about the editorial, but also for linking to this blog. Thanks Jeff! Previously I wrote about how Lower Chichester Township in Pennsylvania was considering an ordinance that would require new residents to submit a listing of all the firearms, ammunition, and powder that would be stored in their new homes. Of course, this is a violation of Pennsylvania’s preemption laws. Well, that ordinance has been tabled and will not be taking effect. Many thanks to the NRA and NRA members for voicing their opposition to the measure. TGSCOM, who runs sites like TopGlock.com, is offering guns at cost for the next two weeks. See the press release here. While TGSCOM has long provided excellent service, a wide selection, and good prices, the company has been more widely known amongst the non-gunny public as being the vendor who sold the Walther P22 used by the VT shooter and magazines to the NIU shooter. Of course, magazines are perfectly legal to order through the mail, and the gun was shipped to a Virginia FFL who did the required background check, so TGSCOM is not in the least bit responsible for the tragedies that followed. It’s just their bad luck. Eric Thompson, the owner, hopes that by selling guns at cost (he doesn’t make any profit at all from this sale) he’ll be able to equip more private citizens so they’ll be able to defend themselves against criminal attack. A worthy goal indeed, and something that my Gentle Readers should seriously consider taking Mr. Thompson up on.